Putting Ardija's perennial struggle for J1 survival aside for one moment, there has been an intriguing battle at the top of the J1 table, which has now come down to two teams. Those two teams have been there or thereabouts all season, and of course they therefore have also been the two most consistent teams in the league. Sanfrecce Hiroshima and Vegalta Sendai. Urawa Reds have been flashy at times this season, and I have to say, fairly consistently third in the table, but they lack a certain something before they look like winning another J1 title. The killer instinct. They might have it in front of goal at times, but not enough, and they might over-run a team in midfield, with flair and skill which is very pleasing to watch, but they certainly lack it in defence. There are many ways to kill off a team and Reds haven't quite worked out how yet. This has left them unable to pull away from the rest of the pack, and has cost them any realistic hope of winning the title 3 games from the end. There are a number of teams fighting it out for Asian Champions League places with 3 points currently separating 3rd place Urawa from 8th place Kashiwa Reysol. Of those teams - Reds I have just discussed, the rest are Grampus, S-Pulse, Marinos, Sagan Tosu and Reysol. From among those teams I have been most impressed with S-Pulse. They are a young side looking to build for the future and they play a brand of football which is attractive to watch. I think their coach has the right attitude to football and one which should bring S-Pulse success in the coming years. However I feel right now they still need something extra to push them on to the next level. I imagine that might be a goalscorer to support the goals of Genki Omae and to tighten up their defence. So back to the two leaders. Sanfrecce and Vegalta at the top means we are going to get a new champion of J1. Sanfrecce did win the stage one of the J1 championship in 1994, but they lost the championship play off to stage 2 winners Verdy Kawasaki. So, effectively we will get a new J1 champion and that can only be a good thing for the development of club football in Japan, and give hope to fans that you don't need to be an Antlers fan to see your club be successful. The clubs have proved the doubters wrong this season, as many pundits predicted that either one of them would fall away at some point in the season. This just hasn't happened and furthermore, neither has one of them managed to pull away and open up a reasonable gap at the top of the table. Perhaps each team's performances and success has driven the other on and consequently they have handled the pressure that comes with leading the table so much better than expected. So who is going to get over the finishing line in first place. Many neutrals would vote for the men from Sendai. This is the emotional call. The team has represented the areas in Japan devastated by the March 11th 2011 earthquake with pride and strength, and given many people still suffering in those areas much hope and heart. However, emotions are not enough to win the title, and Vegalta have backed this up with very strong and determined displays on the pitch. Durability and getting results where other teams would have walked away with nothing, has been a key factor in their season. It's built on teamwork and sheer handwork, which might not always be pretty, but it is something I respect the team for. They offer the J League an alternative style to the general rule of how Japanese club sides play. They harry other defenders into making mistakes, and they can counter swiftly and make your team pay for their errors. Their on-pitch attitude can sometimes bring criticisms from fans of other teams, but again I see this as a good thing in the development of the league. The best leagues have a variety of clubs, styles of play, rivalries and players. I still think the J League needs some work in this area. Vegalta Sendai and also this season's J1 newcomers, Sagan Tosu serve up a different brand of football to which most Japanese club sides play. For Vegalta, up front Shingo Akamine has been their goal machine, and he has also been ably supported by Brazilian import, Wilson. If their defence remains strong, and their midfield can win the ball quickly and launch swift attacks, they have the firepower to win the title, and the never-say-die attitude to pull it off. Sanfrecce Hiroshima finished 7th in the last two J1 seasons, and most people would have expected them to push for an Asian Champions League place this season. Instead, they have surprised J1 observers by challenging for the title at the top of the league for most of the season. 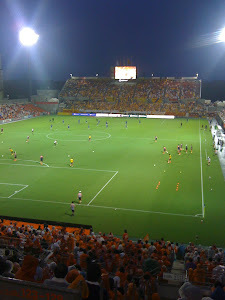 Compared to Vegalta, I find Sanfrecce's style of play much more pleasing on the eye. They score goals too. In Hisato Sato they have the league's top scorer and surely he will win the Golden Boot in Japan this season, and perhaps given the rarity of goal machines in Japan, he deserves to be named player of the season and get a spot in the national team. Japan's national team always frustrates me with so much midfield ability and creativity, yet they score so few goals unless they are playing a very low ranked minor footballing nation. Okazaki is a player who surely only gets the nod because of his effort, he's a nice guy and somehow plays in Germany. I wouldn't pick him, if I were coach. Back to Hiroshima, their players are all comfortable on the ball, the forward line displays some impressive inter-play passing and touches as well as doing the business in front of goal. As an Ardija fan, it's both great but galling to see Naoki Ishihara doing so well this season at Sanfrecce. So who is going to win. From a purist point of view it should be Sanfrecce, from a tactical and pragmatic approach it could very well be Vegalta. It won't be Urawa Reds unless a minor miracle takes place and that will keep us Squirrels fans happy. Finally it will come down to who has the guts and courage to see the job through. A bit of luck too might come in handy. It's been close all the way so far, the next 3 games are going to be fun to watch. Enjoy. as if I wrote this - agree 99 percent but think the problem with Reds is their fans' expectations being too high contributing to the hot/cold performances there of the MUFC wannabes. cheers for the comment. Yeah that's another part of the Urawa problem too. I do however think their team is improving in performance as well as league position too. About their expectations being too high, I know what you mean. However as an Ardija fan sometimes I get bored of our club seeming to have no expectations other than to escape relegation year after year. I'd love a cup run!